“Training” wild sharks to eat lionfish might sound like a good idea. But what happens if they are actually being “trained” to attack divers? Since the lionfish invasion hit the news, people have suggested that native predators will eat and control invasive lionfish. For more information check out our previous posts The Great Debate: Predators vs Lionfish and Who’s “Lyin'” about Lionfish?. But with current evidence suggesting that the current level of predation by native predators is not enough to control lionfish (Hackerott et al. 2013 and Raymond et al. 2014) people have started to suggest “training” native predators to eat lionfish by feeding speared lionfish to sharks, grouper, barracuda, eels, and other predators. A recent paper reports that individual lionfish that were tethered in place on reefs where divers frequently spear lionfish (and presumably feed them to the local predators) were eaten by native predators. 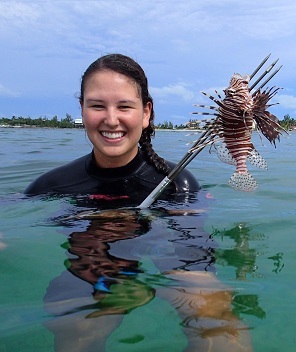 Authors claim this is evidence that native predators can in fact be “trained” to eat lionfish. However, there has been an unfortunate consequence of divers attempting to “train” predators to eat lionfish. It seems that instead of learning to associate lionfish with food, predators like sharks and barracuda are associating divers with food. This is leading to uncharacteristically aggressive behavior towards divers as seen in the video above. As a SCUBA diver with over 10 years of experience, I am very comfortable diving with sharks in a natural setting. Personally, though, I would not like sharks to start expecting me to bring snacks every time I enter the water. Tags: Lionfish, lionfish invasion, lionfish shark attack video, SCUBA, shark, shark attack. Bookmark the permalink.